Rev. Lonnie Hoelscher accepted the call to pastor New Harmony Baptist Church on February 2, 2014. 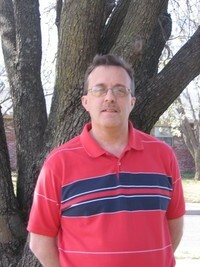 Lonnie was saved and baptized at 6 years of age in Sapulpa, Ok and surrendered to the ministry in March of 2009. Lonnie attended and served at Eastern Heights Baptist Church for 18 years where he worked in youth ministry as a Sunday school teacher, Youth Coordinator, Mission trip leader/coordinator, adult Sunday school director and teacher, and deacon since 2000. From August 2012 to January 2014 he served on staff as Director of Education and Evangelism. Upon high school graduation in Bentonville, Arkansas, he attended NEO A&M College and graduated from Oklahoma State University in May, 1991 with a Bachelor of Science in Agriculture—Animal Science. 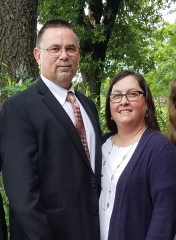 Lonnie has been a farmer/rancher for the last 23 years and completed his Masters of Divinity from Southwestern Baptist Theological Seminary in May of 2014. He and his wife Amy were married June 1, 1991 and have four daughters. Kelsie is married, she and her husband live in Bartlesville, OK. Lauren born in 1997 and Kayla in 2000, both attend Oklahoma State University and Alison in 2003 and attends Bartlesville High School. Bro Stan leads with his guitar and there is no hymn foreign to his up bringing. He is married to Nikole and has three children.